#HighwaysHack is fast approaching. Loads of fab people have already stepped up to get stuck in to two days of hacking the road network in England, and free tickets are still available. 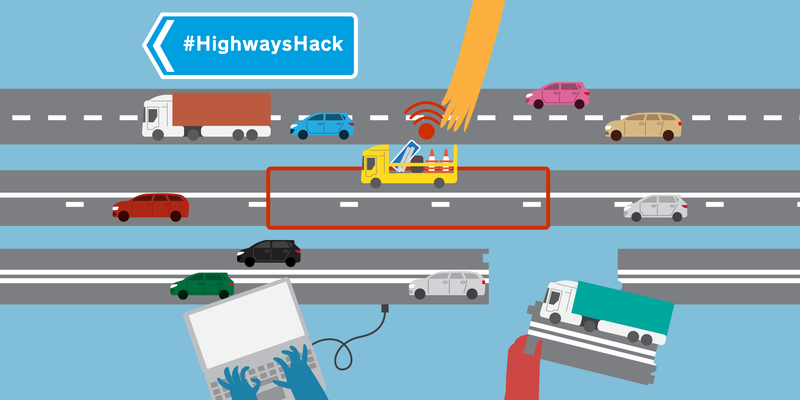 Since the general meeting in June, we've been busy working with Highways England to get data ready for #HighwaysHack16. Notes and ideas from that meeting can be found in this Google Doc and people can still contribute. There are now over forty people registered and we will be joined by Highways England, DfT, RAC Foundation, Leeds, Bradford & Calderdale Council, West Yorkshire Combined Authority as well as technologists, data scientists and developers from across the UK. Highways England have identified three challenges/priorities. 'When is the best time to travel?' A question often asked by road users and usually answered by local knowledge and experience. But what happens if something has affected the traffic, like the weather? Or an accident? Or a sporting event? Could a service be created that provides accurate, timely traffic information that can be communicated enroute? How do you partner with mapping/sat nav companies to provide a bespoke service instead of relying on assumptions based on GPS/floating vehicle data? 'Will I get stuck in traffic because of roadworks? Is there a different route I could take?' A commuter's worst nightmare. 9am on a Monday morning and still stuck in a car, with seemingly no hope of getting anywhere, let alone getting to work. How can national and local highways authorities plan roadworks more collaboratively to prevent disruption to road users? Would agreed standards/formats/platforms allow better working? 'How busy will the network be in 5-15 years? Can we cope?' No one really knows what to expect in the next year, let alone 15 years. At a time of high innovation and serious questions about population growth and the urban environment, what role will the roads play in the future? More cars? Fewer cars? More public transport? Will people embrace mobility-as-a-service? Update: we've now filled all the places for #HighwaysHack. If you've signed up and can no longer attend, let us know and we can give your ticket to someone on the waiting list.